You can create almost any type of website you want using WordPress. However, you can’t use it to build simple static HTML websites. In some cases, that’s all you need, and you may end up needing to use another platform to achieve it. Fortunately, there’s very little you can’t do with WordPress plugins. In this article, we’ll talk about when it makes sense to use simple static WordPress pages. We’ll also introduce you to a plugin that enables you to generate static WordPress pages and discuss how to host them. It can be better for security purposes. With static pages, your server doesn’t need to ‘render’ your site each time someone visits it. Instead, it just sends them simple HTML and CSS, so it’s harder to exploit your website. Static pages tend to be faster. Static pages generally load faster since your server doesn’t need to generate them on the fly. They’re less prone to errors. WordPress is very user-friendly, but errors can still occur. With static pages, most of these, such as database connection errors, won’t be a problem. While static pages have clear benefits, it’s no coincidence the web is steadily moving towards more and more sites using Content Management Systems (CMS) instead of building pages from scratch. This is because dynamic pages enable you to implement many more advanced features. Let’s look at a quick example. With a static blog, you’d need to update your homepage every time you create a post. That means adding a new blurb, featured image, and more for every single update. WordPress, on the other hand, does all that heavy lifting in the background thanks to the loop. However, if you want to set up a website you won’t need to update often, static pages will work great. Likewise, sites with very simple functionality, such as small portfolios or online archives, might be better off with a static approach. The downside is you usually wouldn’t be able to use WordPress to create those sites. With Divi, it might take you only a few hours to set up a professional looking website with a couple of pages. However, they wouldn’t be static. Fortunately, there’s a plugin that can help. The WP Static HTML Output plugin has been around for a while, and for good reason. This plugin enables you to generate fully static copies of your entire WordPress website and to deploy them to other platforms. On top of transforming your WordPress pages into static copies, the plugin can also replace all its internal links. In practice, this enables you to use WordPress to create your website in a local test environment, and then deploy it on your hosting platform of choice. WP Static HTML Output also packs all your media files when you export your website. You can also use it to store a past copy of your site as a backup. However, keep in mind it’ll run into trouble if you try to use it to replicate dynamic features, such as comments sections, log-in forms, and more. Generally speaking, if there’s functionality on your site that requires user input or could be considered dynamic, it won’t work when you translate it into a static page, so bear that in mind while considering whether to use the plugin. Create fully static copies of your entire WordPress website. Export your content alongside all your media files. Replace all your internal links so you can deploy your static WordPress pages to a live environment. Store copies of past exports as backups. Rewrite the paths for your WordPress content to hide the fact your website uses the platform. In this section, we’re going to show you how to deploy your static WordPress pages to GitHub. GitHub enables you to host static pages for free, which makes it a decent option if you want to use it as a no-frills host for static pages. For this step, we’re going to use the WP Static HTML Output plugin that we introduced earlier. Go ahead and install and activate it on your website now. Once that’s done, go to the Tools > WP Static HTML Output tab on your site. This setting will take all your internal links and replace them with the URL you set. Earlier, we talked about how you can use this feature to create sites locally and deploy them in a live environment. As such, you might want to check out our tips on how to choose the perfect domain name. If you copy and paste that link on your navigation bar, you’ll be able to download a static copy of your website directly, so you don’t have to use FTP. Once you have your static site, it’s time to test and publish it. At this point, you should have all the static files created from your WordPress website. It’s now time to find somewhere to host them, so you can check if they’re working as intended. 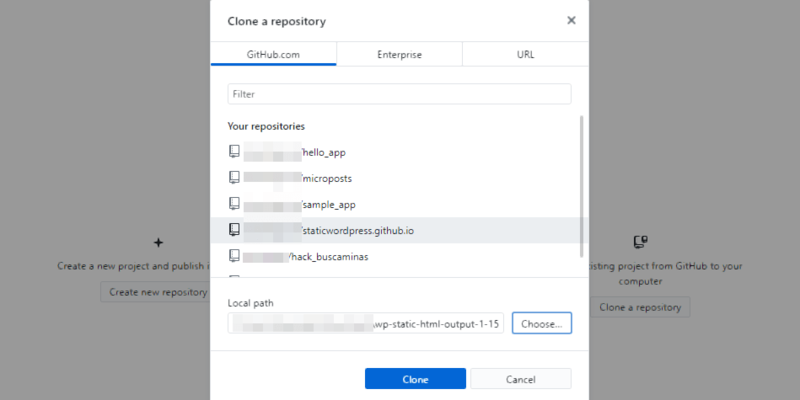 Let’s do this using GitHub, which enables you to set up simple static pages through repositories. If you haven’t used GitHub before, or need a reminder, here’s a quick guide to get you started with the platform. Once your repository is ready, you need to upload your WordPress files to it. For this, you can use the command line if you’re familiar with git version control or use GitHub’s desktop app. We’ll use the desktop approach here since it’s easier to follow along. Now, when you click the Publish button at the top of the app your changes will be uploaded to GitHub. As we mentioned earlier, some parts of your website might not work if they rely on dynamic content, such as comment sections. However, if this is the case, you would likely have any use for static pages anyway and should stick to use WordPress as normal. In some cases, simple HTML and a little CSS is all you need to build an informative and elegant website. 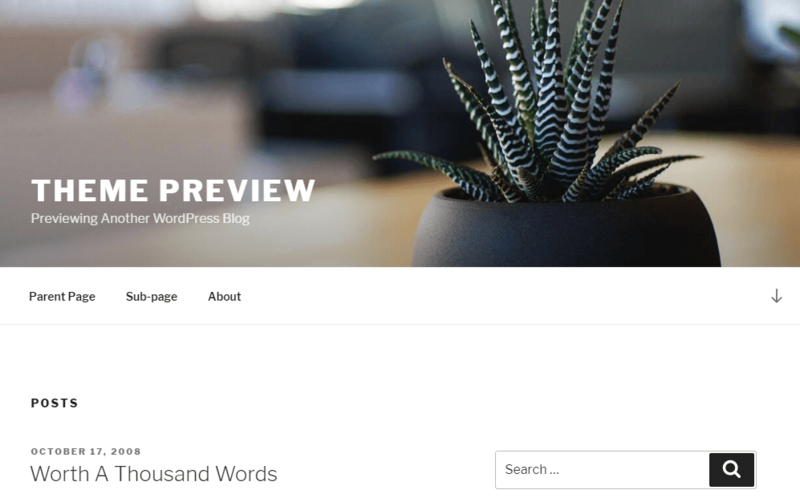 However, WordPress generates dynamic pages out of the box. That’s far from a bad thing, but it does mean you need to do a little tinkering if you want to create static WordPress pages. Use the WP Static HTML Output plugin to create a static copy of your site. Upload your static pages to GitHub. Do you have any questions about creating static WordPress pages? Let’s talk about them in the comments section below! I used this plugin to make “display sites” for clients to preview. I found having a WP installation for each display site took up too many resources. As you mentioned, it’s also faster to load and less issues with security breaches. But I did find generating the html to be resource intensive on my host so started developing on localhost. I’m glad you found it works well for you, Mark! Thanks for your point about it requiring additional resources as well, I think that’s well-worth considering. Does this work ok with all of the short codes that Divi produces or will we see a list of [shortcode_boxes] like these? Would sliders work in this configuration? This looks like an excellent tool for demo sites for potential clients. Does this also with the new word press configurations ? I notice when they do updated it can often change these applications ? Or perhaps I could be mistaken ? Hello Joe. 🙂 I’m afraid I don’t quite understand what you’re asking. Could you please rephrase your question or give me an example? This is a wonderful plugin. I came across situations where client wants a static website similar to a WordPress theme. This is a great help in such situations. Thanks John, for the great how-to, it’s putting me to shame how little documentation I’ve got in the plugin today! I’m Leon Stafford, author of the plugin mentioned and always pleased to see it solving real problems for users. There’re some big updates coming to the plugin soon, with regards to usability, features and documentation. Free or premium, please shoot me an email with any questions you have about the plugin, I’m always eager to help get more people benefiting from statically hosting their WP site. Wow what a great trick guys, I agree simple HTML and a little CSS is all you need to build an informative and elegant website and you can start working online. Great insight. How would contact forms work with this setup? I’ve been asking the Divi people for a solution like this for a long time. I’d host them on Netlify for free. I had come accross this plugin and tested it, but wasn’t sure about using it for my clients. Thanks for the post, you guys are great. I haven’t tested creating static pages containing contact forms myself so I’m afraid I can’t answer. This is a great resource that I will be testing in the coming days since most of my work involves information sites. I do have one question, you mention dynamic content, like comments and the like, not working for obvious reasons, but don’t mention contact forms, will they work? specially the built-in one? In case they don’t, do you recommend an alternative? This plugin is actually just one of a few ways to generate a static website from WordPress. The issue isn’t generating the website, it’s generating a static website with working “search” functionality. This requires setting up something outside of the built-in WordPress search. Next time you revisit this topic, you might consider saying a few words about how to address this issue. Glad you reminded me of this. I tried it a year ago or so and I got notices from my hosting company that I had maxed out my resources. Is this common? Unfortunately, I haven’t come across that particular issue myself so I’m unable to give any further assistance. Does this affect SEO or is a depreciated method? I am cautious and would like to know that before i use them for Great clients. Is there a way to do the opposite? Html to WordPress? There are caching solutions like SiteGround’s SuperCacher which I believe generates static pages and stores them in dynamic memory. This was interesting, I never even thought about having a static copy of my wordpress site. I learnt something new today. I think for localhost, you just have to configure the .hosts file to point to the url you want even in local. Will the output be responsive? I haven’t tested this much myself, but as far as I know, since the plugin does generate the CSS it needs to keep your page looking the same, it should be responsive. However, I would still triple-check any static pages you create using a mobile device, particularly if they have complex layouts.